This is a well researched book by author Lisa Genova, a neuroscientist at Harvard, on a topic that is true for more than two hundred thousand people in the U.S. alone–that figure does not include their loved ones, who early onset Alzheimer’s Disease also severely impacts. Early onset Alzheimer’s is the label given to people in their 30’s, 40’s and 50’s who are stricken with this genetically inherited neurodegenerative disorder. This fictional story of Alice (who seems to represent a composite of many real individuals) is heartbreaking–but utterly fascinating. Its intrigue factor is one reason readers might stay with the story even though, arguably, it pushes “The Bell Jar” by Sylvia Plath down the list of depressing reads! Perhaps what will draw you into this story the most is that readers only know what Alice is experiencing through her sense of recognition. So when this once brilliant, vibrant and formidable protagonist recognizes the person who helped save her from walking into traffic as “the kind stranger,” you, the reader, have to discern that this “kind man” is actually her husband based on the fact that a moment earlier she was holding hands with him and was fully aware of who he is and what he means to her. 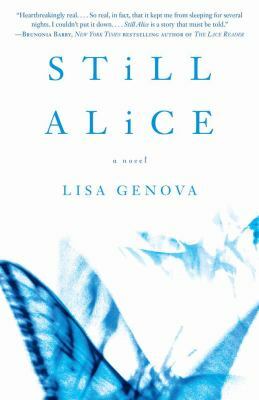 Although the author does an amazing job in reminding us that to be human is so much more than our perceived intellect…and that love is the one thing we require to feel whole (and Alice is fully capable of loving and of being loved until the story’s end), there is no escaping the sadness of this novel. I hope other readers feel differently and instead see this as a story that, while tragic, is still one of triumph (I did see that to some degree, but just not as much as I wish I could have). Suggested read alike authors include Jodi Picoult whose novels revolve around everyday people coping with difficult circumstances and controversial issues; Oliver Sacks, neurologist, and author of numerous best-selling books that were inspired by case studies of people with neurological disorders. You may even want to stop in and check out the award winning movies “Awakenings” and “The Music Never Stopped” based on Sack’s printed works!